When you think of criminals on the run during the 1920’s and 1930’s, you may think of some of the fugitives of the past such as John Dillinger, “Baby Face” Nelson and maybe even the infamous pair of Bonnie and Clyde. Sometimes, we as people romanticize the whole idea of being “on the run,” evading police at every turn. The entertainment world has succeeded in callousing our minds into thinking that was an exciting era, full of danger, suspense at every corner and the ideology of “ride or die” thinking. Sadly, we do not remind ourselves of the victims of these "criminals" often enough. Most go on leaving a trail of blood and death and so many ignore that part, only choosing to remember the exciting parts. When you think of California history during such an era, one would assume that we would not have too many stories in comparison to the Dillinger’s and the Bonnie and Clyde’s of that time period, or do we? 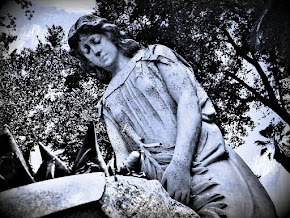 Well, I have a story for you….one of deception and murder. This is a true story, one that would go on to make nationwide headlines and one that would seal the fate of one, Willard Shannon. A story, that after reading you won't soon forget. Given up at birth and placed in a foster home at the age of four months old, Willard Shannon had a rough start from the very beginning. As a young man he served time in Eastern State Penitentiary and eventually was moved to Folsom Prison, where he was released in 1926. He knew only how to make a living the wrong way and became institutionalized in the worst way. Fixated on a scheme that would bring him great fortune, Shannon decided to set his sights on robbing several California mining men in Amador County. It took several weeks to plan but Shannon eventually convinced a automobile salesman by the name of Harold Lage to travel with him up to Amador County to purchase a vehicle. Perhaps, under the rouse of showing him his “mine” that he allegedly owned, Shannon lured Lage up to the area known as Defender. It was obvious that Shannon was a liar. He went about telling people that he was in fact a wealthy miner who had plenty of money to go around. There were two different stories printed in the paper in regards to where Lage was killed. One story says that Shannon stated he and two other friends (unidentified) planned to rob Lage’s home in Stockton . They shot Lage in Lage’s own garage and then drove up to the mountains of Amador County to dispose of his body. This is interesting because eye witness accounts stated that Lage was seen arriving to Jackson in his car and then leaving with Shannon up into the mountains. According to records, Shannon paid Lage for the vehicle with two counterfeit checks and it wasn’t until Shannon disposed of the body that he started claiming that he was in fact Harold Lage. Had he killed Lage prior, why would he identify himself as Shannon on his way up the mountain, stopping in Jackson? It seems that either Lage caught him in a lie once they were up there or perhaps Shannon just felt it was better to dispose of Lage all together once he had him in a desolate area and once he had Lage's car. Nevertheless, Shannon shot Lage and disposed of his body under the cover of thick brush and deep wilderness in the vicinity of Pioneer, California. At that point in time, the area was known as Defender (previously Contreras) and it was close to the Defender Mine. In fact, Lage’s shoes and socks were found near one of the abandoned mines in the area. It took dozens of men searching the area before some local boys discovered Lage’s body, and the cause of death was then determined. On December 31, 1926, Willard Shannon killed and disposed of Harold Lage's body. Shannon then decided to take on the “persona” of Harold Lage himself. Once he was departing the area alone, he then told a resident of Jackson that his name was now Harold Lage. It was only after giving the description of the man the witness saw, that authorities determined it was Willard “Red” Shannon, not Lage that the witness had spoken to. At one point the Lincoln that Shannon had stolen from Lage was mired in the mud at Jackson Point. A young teamster was called to aid in the removal of the vehicle from the mud. The witness claimed that Shannon was alone. Once the vehicle was released from the muddy dirt, Shannon traveled down Highway 49 headed for Sonora. He stopped to purchase some merchandise, using Harold Lage’s checkbook. When he learned that the roads past Sonora were blocked due to weather conditions and mud, he returned to Sonora and booked a room at the Hotel Victoria (later renamed The Sonora Inn). In order to pay for his room Shannon signed over to the Hotel, Harold Lage’s Christmas Bonus check that was within his wallet. Shannon travelled through Yosemite and down into Southern California evading police the entire time. During the manhunt for Shannon, the newspapers mention that the main highways were being canvassed by deputies armed with machine guns, ordered from Sheriff Lucot and other law enforcement throughout the state. Can you imagine? According to newspaper archives, Shannon made it to his aunt’s home in Santa Maria and also to visit a sister in Lompoc. He even gave his aunt a ride home where he slept over for the night, before leaving again the next day. He told her he was going to Oakland, but that was not the case. He then went to the salesroom of another automobile dealership. He had planned to ditch Lage’s car and get himself another one. 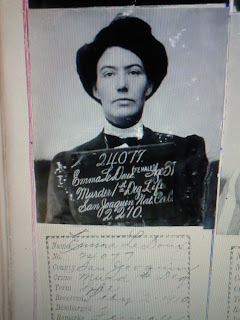 According the man who may have been Shannon’s next victim, John Ross (an auto salesman in Bakersfield), Shannon tried to convince him that he was a wealthy miner with plenty of money. He also admitted that he was coming into more fortune in the coming weeks and that his money was in the form of gold, so that he just wanted to take a “test drive” on a new Chrysler. He explained that he had no intention of purchasing a vehicle that day, and that he would have to return to get it, but was adamant that he wanted to take it for a spin. The salesman had suspicions about Shannon, and it was obvious that Shannon caught on to it. Finally, Shannon retreated in a hurry. Throughout his various travels Shannon would leave telegrams in Harold Lage’s name, even going so far as to send telegrams to Lage's wife hoping to avoid the authorities suspicion of whether or not Harold Lage was in fact missing or worse, dead. He couldn't do that for long though, since eventually Lage's body was found. In a last ditch effort to rid his ties to Lage, Shannon sent a telegram at the Western Union, stopped to ask two Boy Scouts for directions to Los Angeles (as he was in a hurry) and ditched Lage’s car in Paso Robles, California. Boarding a train to Chicago, Shannon escaped out of California without one hitch and laid in hiding for several days. He then travelled to Butte, Montana and then onto Salt Lake City, Utah around January 29th, 1927. It was in Salt Lake City that he met an architect by the name of Walter R.Ware. Shannon was now completely penniless, so he begged Ware for a job at his company. While he was there, Shannon stole checks from Ware’s office and attempted to purchase a ticket to Los Angeles. The ticket agent grew suspicious when Shannon asked if he could write him a check. The police where then called and Shannon was arrested upon boarding the train. Once Sheriff Lucot of Amador County learned that Shannon was being held in Salt Lake City, on charges of forgery under the alias Walter Riley, he traveled to Salt Lake City to make sure this was the right man that he was hunting for. As soon as he got there, it was confirmed, Walter Riley was in fact the murderer Willard Shannon, and Sheriff Lucot was determined to bring him back to Amador County to face the consequences for the crime Shannon had committed. Once in Utah, the Sheriff had Shannon extradited over to California where the trial for the murder of Harold Lage began. Shannon had admitted to authorities in Utah, that he was involved in the death of Lage. He also claimed that two other accomplices were the real murderers and that he was just another witness. He refused to reveal the names of these two "accomplices" he claimed were involved. Of course, no one bought his story and the trial started quickly. According to the papers, the trial was one of the quickest of record at that time in the state of California. The trial started on a Monday and ended three days later. The jury was out for a whole thirty minutes before returning with a unanimous verdict. On March 23, 1927 at approximately 5:15 pm, Shannon was found guilty of murder in the 1st degree and Judge Vicini ordered that he be hung until dead. The night before his execution, Shannon requested that his last meal be toast, strawberries and chocolate. He also requested a phonograph to play the Shannon Quartet's song, “The Sidewalks of New York” over and over, while he sat impatiently smoking cigarettes awaiting his doom. After three failed attempts of appealing the verdict, inmate # 14663, was hung on May 5, 1928 at 10:02 am at Folsom Prison. It took Shannon 10 minutes to die and he was pronounced dead at exactly 10:12 am. 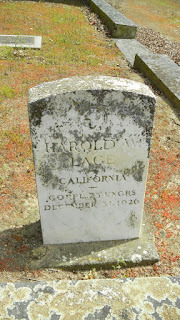 The victim, Harold W. Lage who suffered a terrible death at the hands of Willard "Red" Shannon (nicknamed for his auburn hair), was laid to rest at the Woodbridge Cemetery in Woodbridge, California. ( Address: 19071 Lower Sacramento Road, Woodbridge CA 95258). 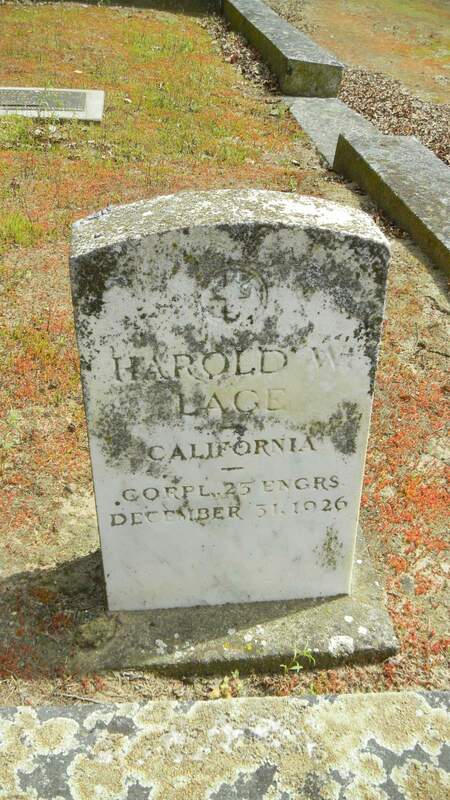 The internment for Harold W. Lage was on January 10, 1927. Services prior to that were held in Stockton with Leroy Johnson, a chaplain for Karl Ross Post of the American Legion performing the service. Also, a Practioner of Christian Science was there by the name of William Yarnold who spoke as well. Pall bearers were fellow members of the American Legion. He was laid to rest on Plot 3.4. Harold was a native of Iowa. He served during World War I, having enlisted with the 23rd Engineers in 1917. He later settled in Stockton as an automobile salesman. Harold was only 29 years of age at the time of his death. His wife, Avis Lage, was forced to raise two children on her own. His son, Harold W. Lage Jr and daughter Lois moved to Woodbridge in 1928. Upon my investigating I learned that his son Harold Jr, went on to lead a productive and interesting life. Avis, remarried a man by the name of Fred Burgstahler of Lodi. Harold W. Lage, Jr. attended high school and graduated from Lodi High in 1943. He then served in the Army Air Corps during World War II, returning to Stockton after the war. Later, he moved out to Minnesota and onto Texas where he worked as a service representative for White Equipment Company in the late 1950's. He enjoyed hunting and fishing according to his obituary. Sadly, at just the age of 63, after an unexpected illness Harold W. Lage, Jr. passed away on January 30,1988. He was buried next to his father Harold W. Lage, Sr. on Plot # 3.4 at Woodbridge Cemetery as well. Although I am sure that Harold Lage’s family was never the same after his death, I would hope that his wife found some sense of closure after Shannon’s execution. 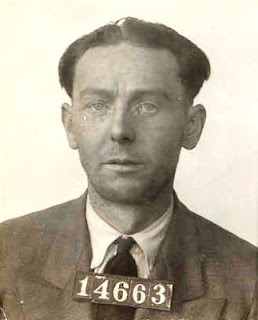 The newspaper’s claimed that once Shannon had been apprehended in Salt Lake City that Lage's wife was ecstatic, claiming it had been so difficult for her knowing that he had gotten away with murder and continued to evade the police for so long. I hope that wherever Harold Lage’s family is today, that they were able to keep his memory alive and hold it dear to their hearts, not allowing Shannon to rob them of that, too. To read an in depth account of Willard Shannon's time in Folsom, as well as his execution please check out the book "Folsom's 93" by April Moore. NOTE: This is a secondary blog to my original "Dreaming Casually" blog. Many of the posts on this blog are identical to my posts on my original blog. I own copyright to all content on all my blogs. To read all my other blogs please visit my website. 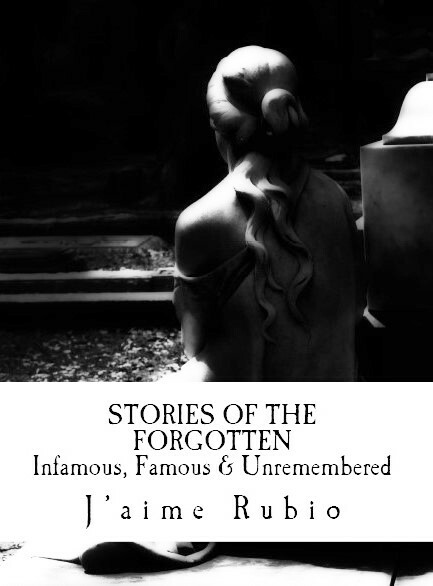 Purchase Your Copy of "Stories of the Forgotten" on Amazon today! Who Was The Beautiful Stranger?